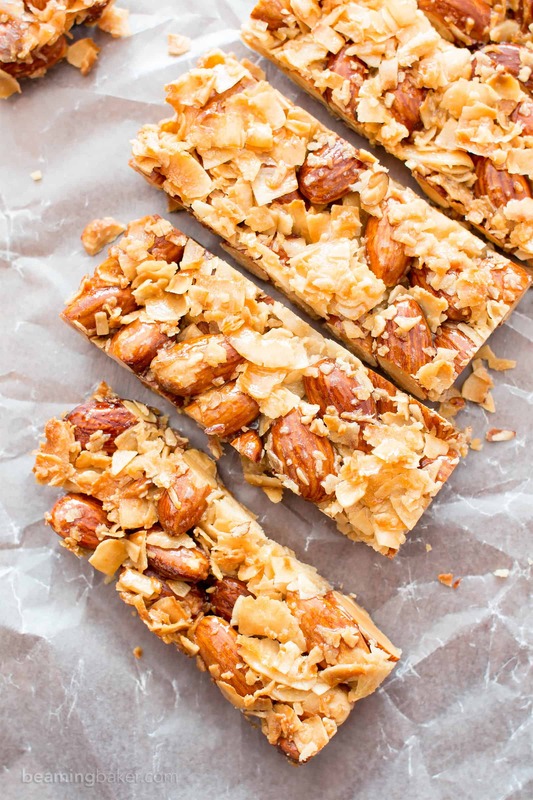 3 Ingredient Homemade KIND Coconut Almond Bar Recipe (V, GF): an easy recipe for homemade paleo KIND bars packed with crunchy almonds and sweet coconut. Only 107 calories, 5g sugar, 7g carbs each. 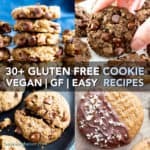 Paleo, Vegan, Gluten-Free, Dairy-Free, Oil-Free. 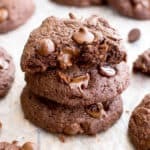 The thing is, as a food blogger, I’m always getting requests for baked goods: cookies, cakes, bars, bites, free chocolate chips, muffins, free peanut butter and more. For some reason, my family thinks I get a bunch of free edible goodies that they’d be “happy” to take off my hands. They’re quite the classy bunch, I tell ya. 😉 J/k, love you guys! … For FREE! Penny: Yeah, it’s really, really good! P: And the flavor is just incredible! 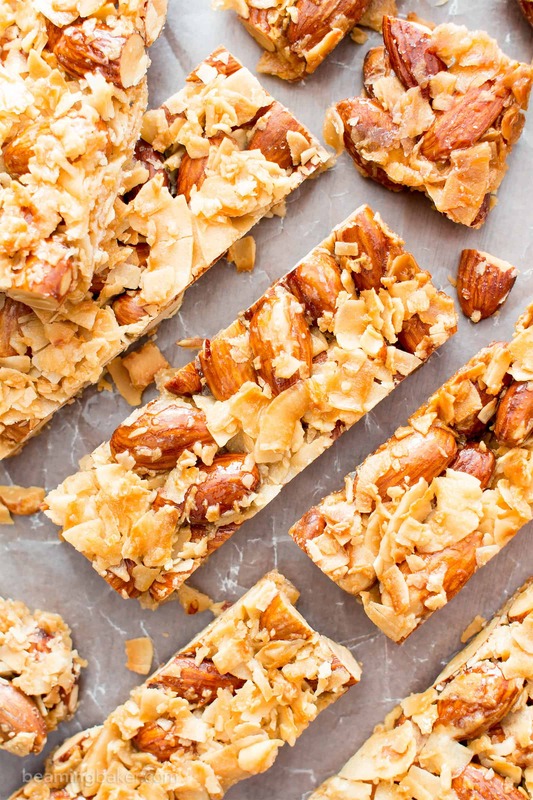 It’s so simple: just coconut and almonds. 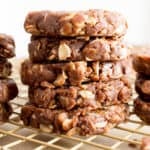 P: And I saw that lots of your readers commented that they’d be VERY happy if you shared a 3 Ingredient Homemade KIND Coconut Almond Bar recipe. M: You know what would be a great idea? I just came up with this!! Like, all by myself. 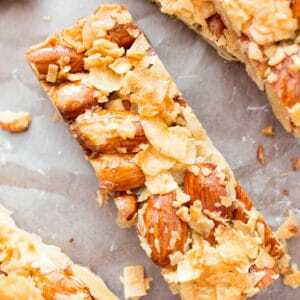 How about I make a 3 Ingredient Homemade KIND Coconut Almond Bar recipe? What do you think? Is that too unexpected? P: YAAAAAAAAAAAAAAAAS!! And you’re so creative!!!! Just kidding! I totally did not say that it was all my idea. Haha. But Penny would’ve rolled with it, secretly thinking that she was so clever in inception-ing me (as Erik calls it). She was pleased as a peach when I told her I might consider it. No promises, even though I would love to give her the world. Sometimes, recipe testing is unexpectedly curveball-filled and I don’t like to make promises I can’t keep. But this time, it all worked out! Phew! Now tell me, what’s your favorite KIND bar flavor? I might just take a stab at it, even though that expression totally spooks me out. 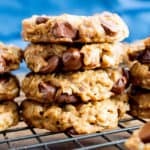 My plan is to create the most epic of homemade KIND bar recipe roundups! So far I also have Homemade Dark Chocolate Sea Salt KIND Nut Bars. If you try those too, let me know what you think! specially requested by my sister Penny, who deserves all the homemade treats in the world! What homemade KIND bar recipe would you like for me to share next? 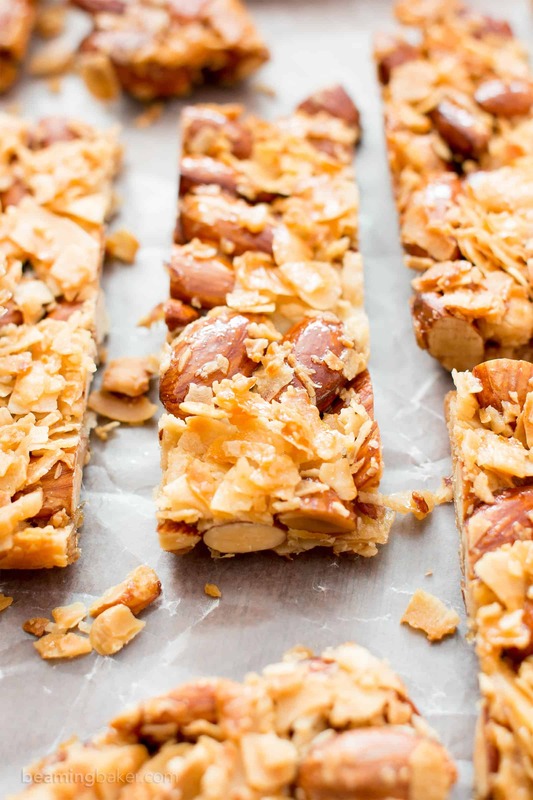 3 Ingredient Homemade KIND Coconut Almond Bar Recipe (V, GF): an easy recipe for homemade paleo KIND bars packed with crunchy almonds and sweet coconut. Just 107 calories each, 7g of carbs and 5g of sugar! Paleo, Vegan, Gluten-Free, Dairy-Free, Oil-Free. Add almonds, coconut and salt (if using) to a large bowl. Stir until well mixed. Pour maple syrup over this mixture. Fold until well incorporated. Pour this mixture into the prepared baking pan. Using a rubber spatula, press down on mixture and smooth into a tightly-packed, even layer. Bake for 28-38 minutes (mine took 33 mins). Bars must bake thoroughly, or they won’t hold together when cooled. 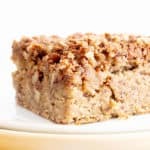 - Adapted from my 5 Ingredient Homemade KIND Nut Bars. - Nutrition Info: is an estimate based on 12 total bars, with no salt used. 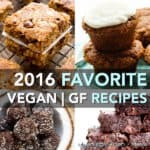 - More Healthy & Delicious Paleo Snacks: Cinnamon Nut Granola, No Bake Almond Butter Chocolate Bars, No Bake Dark Chocolate Brownies. These look delicious! My son cannot have maple syrup. How would honey work as a substitute? These are so good! 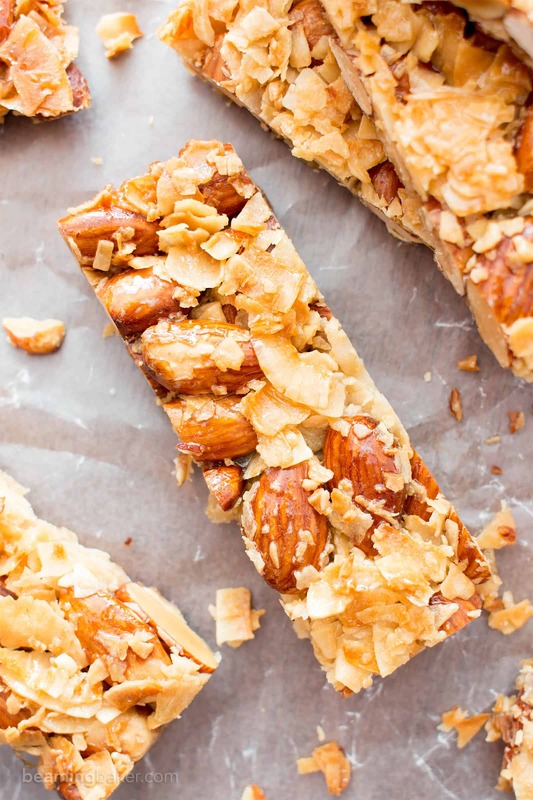 I love the Almond Apricot Kind bars, so I added some chopped, dried apricots to this recipe. Yum! 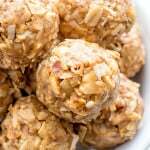 I would love to make these as a healthier Valentine’s Day treat for some co-workers. But what about putting some dark chocolate chunks? What do you suggest for if I want to add chocolate? Hi. Is it possible to sub pureed dates for the maple syrup? Sadly I followed this recipe to the letter and it was a disaster – the mixture started to burn after just 15 minutes at 170’C (325’F) I went slightly lower temperature as it is a fan forced oven…….then when I let it cool in the pan for over an hour the bars just shattered – very sad as a complete waste of time and ingredients. Hi Ann, so sorry to hear that! I know another reader with a fan forced oven had some trouble with a different recipe. Unfortunately, I haven’t developed my recipes for use with a fan forced oven. There probably are other bloggers who have! Best of luck! Can you use unflacked coconut? I just made these, they turned out really well. I think I like them more than the bars that inspired them. I spend a small fortune on kind bars to keep in my car when I don’t get a chance to eat, now I can make them myself. Thanks so much for posting this. Wonderful! I’m so happy that you liked them even more than the original. 🙂 There’s just something so satisfying about making them from scratch (that, and the fact that they’re cheaper lol). Enjoy! Do you know the fiber per serving? Looks divine and eazzy peezy.???? These were SOOOOO good! I also threw in a small handful of pepitas…yum! The flavor was excellent, though I need to improve my cutting skills with them. I think next time I am going to try baking them in a silicone bar mold I have so I don’t have to cut them at all. My 21 year-old son thought they were better than the ones from the store. I agree! 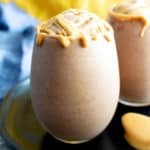 I am making these as a dessert for our Easter brunch, I know they are going to be great. My family loves coconut flakes, almonds and maple!!! I am going to drizzle a high end melted dark chocolate to the bars for an added treat!!! Thank you for this great recipe. I tried making these bars a couple days ago and also had trouble with them shattering. Perhaps I overbaked them? How do you know when between 28 and38 minutes to remove the pan from the oven? 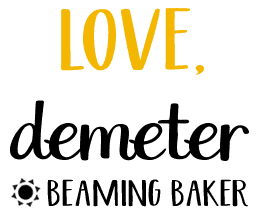 Hi Demeter! I made these recently. The flavor is incredibly awesome. I had a little trouble getting them off the aluminum foil and they were a little dry and hard to cut. Could this have been from using aluminum foil instead of parchment paper? The middle stuck to the foil and I had to dig them off the foil. Nonetheless, I’m making them again tonight. And this time I’ll use parchment paper. Hi, do you think Agave Nectar could be used instead of maple syrup? These bars look absolutely fantastic. Beautiful photos, too. I look forward to trying this. My wife would love it! Thanks Jack! I really appreciate it. Hope you two enjoy! 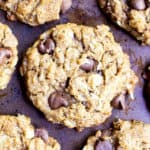 I am so grateful to have this recipe! I made two batches because my husband stole the first to take to work for healthy snacking. Thank you so much! How do you know when they are done? They are stil soft. They are definitely dark enough. Do you think they would still hold together correctly if I used Lakanto Maple Syrup (monkfruit sweetened) in place of maple syrup? Hi Spencer! I haven’t tried baking with the Lakanto maple syrup before, thought their website does say that it can be used in baking. I’d say give it a try and see. 🙂 Let me know how it turns out! How do you keep them from breaking up into little pieces when you cut them? Mine all fell apart. Hi Molly! Try adding on a few more minutes of bake time, and leave them in the pan the entire time to cool. The extra heat can help them to firm up. Hope this helps! 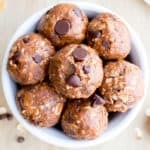 Hi do you think it’s possible to add vanilla protein powder? Not sure if it would dissolve well with just honey? I need to beef up my super skinny grade schooler. HI! Just tried these for the first time – they are cooling as we speak. Can’t wait to see how they turn out. I’m curious though if you have ever cut up the almonds? They seem so big. Also, I was thinking of making some with a mix of different nuts and seeds. Have you ever tried adding chia, flax, or sunflower seeds? Hi Sara! 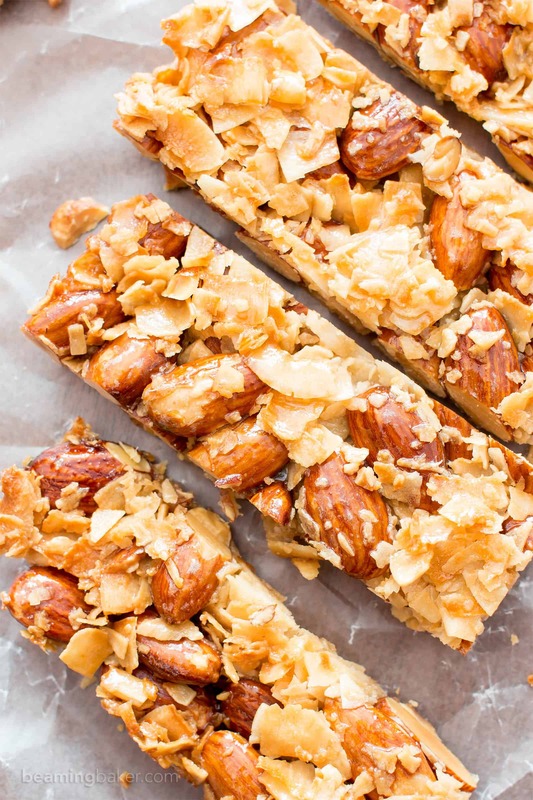 You can definitely try pre-chopping the almonds if you like. I’ve had some readers try a variety of nuts and seeds (sunflower, pumpkin, etc) before with great results, but I haven’t tried flax or chia. Let me know how it turns out! These look great Demeter! 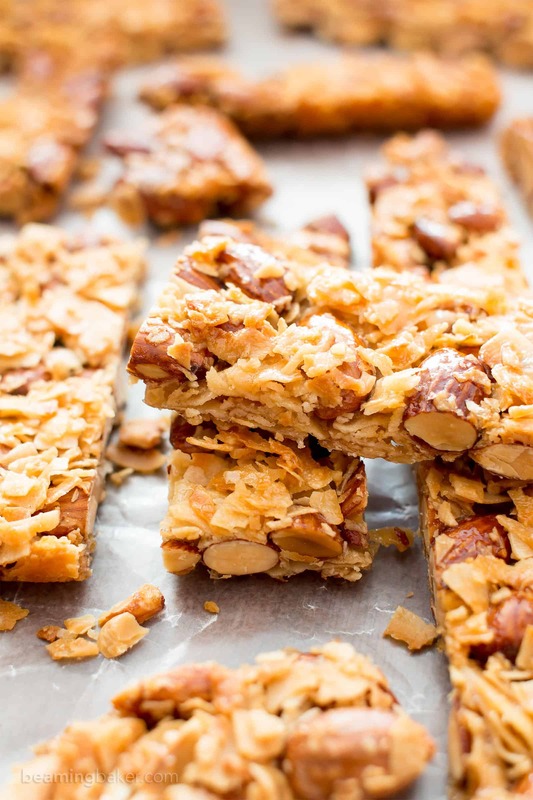 Love making bars at home to save money and control the ingredients! Exactly! It’s such a win-win! ???? Thank you for this great recipe! Is there anything to sub the syrup with? Perhaps dates or date syrup? What about adding some protein powder? Hi dear, thanks for the recipe as always you are fantastic. However i am so disappointed my bars are not stick together when i try to cut them, and i let them to cool i have put enough agave syrup and make them bake enough. So i am wondering why that? I’m not vegan, paleo, GF or any other food related thing. I’ve never had a Kind bar. But these are all ingredients I love so I made them. Omg, so delicious. Trying not to eat them all before dinner. LOVE this!!! Sometimes when you least expect it… you get the perfect thing you never knew you were looking for! 🙂 I’m so happy to hear that you loved my recipe. Enjoy!